The gift of (fun) learning! 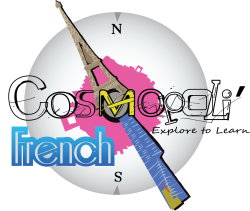 If you are looking for a unique and original gift for a loved one who is French-at-heart, then a Cosmopoli'French Gift Voucher could be the way to go! Get your loved one closer to their French dream by offering them the gift of learning and attend one of our fun French immersion workshops. Shopping in France is a very enjoyable experience. Being able to communicate with the sales staff, conversing in markets with the locals will make this experience even more memorable. Learn key vocabulary, get some insider’s tips and make the most of your next shopping experience! Master the language of gastronomy, learn about regional dishes and get some tips on reading a French menu. Discussing your culinary tastes, talking about your cooking skills or simply talking about your favourite French food won’t have any secret for you! Valid for 10 months from the date of purchase. Can be redeemed for the price of a French immersion one on one class or one of the following workshops: French for Foodies or the Art of shopping. This voucher is not refundable or exchangeable nor it is transferable or redeemable for cash. It is for single use only.